planning for the future of North Dakota. We work to change and rewrite legislation that will protect our land and rights for generations to come. Through knowledge and numbers, we can make a lasting impact in North Dakota. 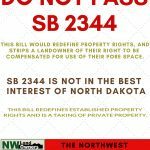 As we work daily with lawmakers and politicians in North Dakota and Washington D.C., NWLA will keep you informed of changes to legislation, legislative proposals and land rights that affect you. Education plays an important role in enacting lasting change. By providing knowledge and resources, we can work together to create better legislation and land practices. Daryl and Christine Peterson, Northwest Landowners Association members, donated $250,000 to the NWLA Foundation. These funds will be used for brine remediation education across North Dakota. The Petersons hope their donation will encourage others to give the NWLA Foundation; and support the education of responsible resource development. We want to hear from you! Your voice and your land matter. Talk to us so we can prepare and pass legislation that will create the most positive impact. Fill out the form and we’ll be in touch shortly. Stay up-to-date on the latest legislation news and progress.